In a previous article, I explained how to upgrade Ubuntu 18.04 and Ubuntu 18.10 to Ubuntu 19.04. However, because Ubuntu 18.10 is stilled supported by the Canonical company, Ubuntu 18.04 users need to upgrade to 18.10 first and follow the same process to upgrade to 19.04. This tutorial will be showing you how to upgrade Ubuntu 18.04 directly to Ubuntu 19.04 from command line, bypassing Ubuntu 18.10. Why Ubuntu 18.04 Needs to Upgrade to 18.10 First? As explained in the previous article, if Ubuntu 18.04 users follow the standard upgrade procedure, they will be told to upgrade to 18.10 first. This is due to the fact that Ubuntu 18.10 is still being supported by Canonical and hasn’t reached end-of-life yet. After Ubuntu 18.10 reaches end-of-life in July 2019, Ubuntu 18.04 users can upgrade to 19.04 directly, following the standard upgrade procedure. If you don’t want to wait 3 months and don’t like upgrading twice, you can follow the instructions below to upgrade to 19.04 directly. Note: Before doing the upgrade, you can use the systemback program to create a bootable ISO image from your current OS. If the upgrade fails, you can easily restore your OS with the bootable ISO. Everything on your OS including software and files will be intact. If you are using a laptop, please connect your power source. The method I’m going to show you is how the Ubuntu distribution upgrade manager works under the hood. The only difference is that we are going to change to upgrade path that Canonical gives us. To save a file in Nano text editor, press Ctrl+O, then press Enter to confirm. To exit, press Ctrl+X. After that, we need to run the following command to change all instances of bionic to disco in the source list file (/etc/apt/sources.list). Bionic is the code name for Ubuntu 18.04, whereas disco is the code name for Ubuntu 19.04. If you have added third-party repositories (PPAs) in the /etc/apt/sources.list file and in /etc/apt/sources.list.d/ directory, please disable third-party repositories. For example, I added the qBittorrent PPA when I was installing qBittorrent on Ubuntu 18.04, but this PPA doesn’t support Ubuntu 19.04 yet, so I open the PPA file. And comment out every line in that file by adding the # symbol at the beginning of each line. Save the file and you are done. After you disable third-party repositories, run the following commands to update software sources and upgrade software to the latest version available in the Ubuntu 19.04 repository. This step is called minimal upgrade. Now you can remove obsolete/unneeded software packages from your Ubuntu system. 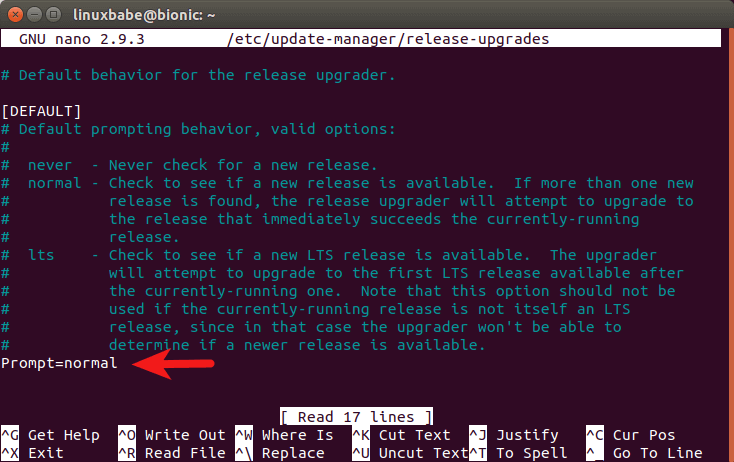 Once restarted, you can open up terminal window and check your Ubuntu version. Hello all, I am using ubuntu 16.04. If I upgrade to 18.04 or even 19.04 will I lose everything I currently have.? The upgrade process will upgrade the base system, but won’t remove the software you installed or the files you created. If everything goes well, you will have a system with all your software and files intact. But I must admit that there’s a bit chance the upgrade can fail. For Ubuntu 16.04 users, I recommend upgrading to 18.04, which is safer than upgrading directly to 19.04. Thank you again, I appreciate your help and guidance. It just occurred to me that there’s a program called systemback that can create a bootable ISO image from your current OS. Every program and file can be included in the ISO. Before doing the upgrade, you can use systemback to create ISO image. If the upgrade fails, you can easily restore your previous OS. hi, i just successfully upgraded from 18.04 to 19.04 using this guide. i noticed that my kernel is still “4.15.0-46-generic”. isn’t it supposed to upgrade to kernel 5.0 in 19.04? to find out if kernel 5.0 is installed on your system. Note that you need to reboot your computer after the upgrade in order to use kernel 5.0. If you don’t see kernel 5.0 in the list, you can install it with the following command. Hello again Xiao Guo An, thank you for the update. I have successfully upgraded to 18.04. I did have some problems after doing so. First, the screen was black, the left side programs were still there. Second, when I got the desktop back again, the folders would not open. Lastly, the internet wouldn’t work. Using my Raspberry Pi, I was able to go online and Google the answers to these problems. I will give the program you mentioned a try and see if I can get a good image of my working drive. One query, I have 2 identical hard drives. Both 2TB, and the computer boots from wherever it wants. I have temporarily solved this by unplugging the image drive. It takes whichever drive it wants to boot from. /dev/sda. I have changed the desktop picture from the image drive so I recognise the difference. Is there a way to stop this from happening.? Today I upgraded my Ubuntu 18.04 to 19.04. Thanks to this article. The reason for my upgrade is because of the scroll bug in chromium based applications which haunt the previous version of GNOME. @Rodney. Your disks probably have the same UUID from cloning ? You can google on “ change uuid “ to find your solution. Hi I was using ubuntu 18.04 and upgrade it to 18.10 but when i try to install 19.10 y get the massage that i have a network problem, but i checked and network is ok, what can i Do?